The diaconate formation experience has exceeded my expectations. I was told time would fly but could never have imagined how fast. My last blog was posted after completing my first semester of the first year. Now I am completing the second semester of the second year! We are blessed to have a wonderful group of God loving men going through this journey together. This group includes the 4th year “seniors” moving into their final year in preparation of ordination. These five men have been a great example of holiness and reverence for our group. Our group, soon to enter the third year of the five year program, numbers 12. Godincidence? We come from all walks of life and have established a camaraderie that will last a lifetime. When the diaconate was re-established, after the Second Vatican Council, it was designed as a three year program. Later it was changed to a four year program and recently moved to five years. A Masters in Theology was added in addition to more pastoral/practical education. We will be truly prepared and educated to serve our assigned flock if we are given the blessing of ordination! Our school year includes classes every Wednesday evening and one Saturday a month at the St. John Vianney Seminary in Miami. In addition we have one full weekend a month at the St. Vincent de Paul Regional Seminary in Boynton Beach. There we are joined with Palm Beach candidates. During our weekends we start and end the days with prayers, with classes sandwiched in between. What a beautiful and moving experience to hear 40 men praying and singing acapela in a small chapel! As a teen I felt the calling to the priesthood and actively explored it. I remember telling my father I was considering the calling and remember when I told him I didn’t think it was for me. About 20 years ago I explored a calling to the diaconate but was told at the time I was too young. 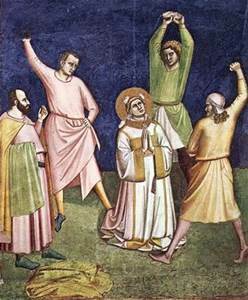 That thinking has changed allowing men with young children to take part in diaconate formation. I tried again a few years ago and was told the program was being updated from four years to five and no enrollments were being accepted at the time. So as we hear many times, it is all up to God’s timing and plan and not up to ours! I am blessed to have the support of my wife and my two daughters. Without their support this program would be impossible to complete. My pastor, along with my Emmaus and Knight brothers have also been prayerfully and financially supportive. I pray every day that other men in my parish join me in this wonderful journey. Work in the ministries was important and rewarding – but this is an awesome experience. The professors are out of this world qualified and inspiring. Our prayer consciences have achieved levels we never thought possible. And we are learning so much more about our faith. If you know of someone that you feel in your heart will make a good candidate for diaconate formation, have them contact their pastor. A new class enters this Fall and that only happens once every two years! Left to right: Ismar, Luis, Steve, Victor, JC, Dr. Brian, Sister, Jorge, Mesmin, Me, Ernie, Dr. Jose and Enrique. This is our group along with Sister Margarita. She has taught at the seminary for 28 years and just announced her retirement. What a blessing for us to have had her as a professor! Please pray for us and our families as we continue the discernment process. We will do the same for you! Our non-Catholic brothers are missing out on one of the greatest blessings we enjoy as Catholics, our Holy Mother. One tends to over hear the oddest comments in busy restaurants. The other day (not meaning to eavesdrop but she was so loud! ) I overheard a diner state: Oh Mary is no big deal; she was just a vessel… That comment shook me to my core. She was just a vessel the same way Jesus was just a prophet! On October 16, 2002, the 24th Anniversary of his election as Roman Pontiff, Blessed Pope John Paul II signed the Apostolic Letter Rosarium Virginis Mariae (the Rosary of the Virgin Mary) that presents the Rosary as an outstanding way to contemplate the face and mysteries of Christ. He also proclaimed a “Year of the Rosary”, which extended from October 2002 to October 2003. Mary was the chosen one. Just as the prophets before and the disciples afterwards. Mary was chosen by God to give birth, raise, nurture and be part of the death and resurrection of our Lord. Mary has been present through various apparitions being there to console and prod us in our faith. Father Michael E. Gaitley has published a treasure of a book allowing us to learn more about the Holy Mother and to consecrate ourselves to her. 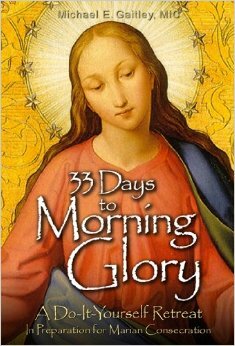 33 Days to Morning Glory has 33 short daily reflections. These reflections are from devoted Marians including Blessed John Paul the II (to be canonized April 22, 2014). There is one particularly powerful reflection in the book. It hits home because we have a daughter living in Los Angeles that we are constantly praying for. St. Maximilian Kolbe calls us to put our prayerful petitions in the Holy Mother’s hands. Then he goes a step further. He tells Her to use his prayer and sacrifices and use them for someone else in more dire need. Having full faith that Mary will get to our petition when it is really needed. That has helped me immensely. Even though we fear for our daughter’s safety I now put those fears in Mary’s hands. I pray to Her to first help those girls more in need than my daughter with the full faith of knowing my daughter will be protected when need be….. This reflection has brought great peace to me. I was blessed that my father was a Marian devotee and hope my example awakens in my daughters the same love of Mary. Mary Queen of Peace, pray for us! Iphones and teens, not always a good combination….. The ostrich effect is the easiest parental theory to implement. There are so many heart aches avoided, so many disappointments averted and peace reigns in our home. It’s just so much easier to look away. It’s so much easier to hide under the pretense that teens need to be trusted. It’s just so much easier not to pry….. But my wife, bless her heart, pries, sticks her head out of the sand and pokes, pokes and pokes some more. She casually mentioned to a close friend the other day to check her daughter’s texts and Instagram in order to be aware of what her daughter is being exposed to. Her friend responded: But you need her Iphone code to do that! I have a friend that says when everyone around you seems crazy, maybe it’s you that’s really crazy! My wife and I are in the minority regarding monitoring Iphone use for our teen. The Iphone is a wonderful entertainment piece and a very efficient business tool. However, it is also a conduit to all that is dangerous with the internet. We have been flabbergasted with the texts we have read and the pictures we have seen from girls we thought were prim, proper and respectful. Many texts each other with regular use of profanity. They send provocative pictures that would destroy their reputations if posted on one of the many social media sites available. They seem innocuous to the ramifications that could come about with their Iphone activity. Colleges are now scouring social media to find out more about applicants. Employers are doing the same. Schools have joined this effort to monitor for inappropriate behavior. The consequences are dire. I know it’s easier to look away, but we MUST get involved. No, a young teen has not earned the right to be fully trusted. No, they do not have the life experience to properly asses a situation and deal with it accordingly. We are abdicating our parental responsibilities by turning a blind eye to the unfettered power of the internet. Get the code and forbid them to change it without giving you the new one. Take the phone away for an hour at a time while at home. Do not allow the phone in the room while they are sleeping. Group chats keep them awake for hours! Do not allow the phone at the dinner table. Today’s teens have lost the art of looking people in the eye and holding a conversation. Use the taking away of the phone as a way of prodding the type of behavior you seek from them. Take it away for a week so you will see the attitude adjustment that creates! On a weekly basis take the phone away without forewarning. Look at the text threads, look at Instagram and Twitter. Search her camera roll. Parenting is a full-time job. Teens need parameters now more than ever. They need our life experience to teach them how to deal with the constant moral threats they are receiving. At the end of our life, we will partake in the ultimate exit interview and final entrance exam! We will be asked what we did as parents to bring our children to God. What did we do to warrant the beautiful blessing we were given? How did we protect them from harm? Did we pry and poke? I for one do not want to fail that exam! Eternity is in the balance…..